To be honest a lot of my limited downtime for gaming this month has been spent on my Titan in Destiny 2, as I continue to enjoy the futuristic gun-play. That said, I did get two with two indie titles that were fun in very different ways. 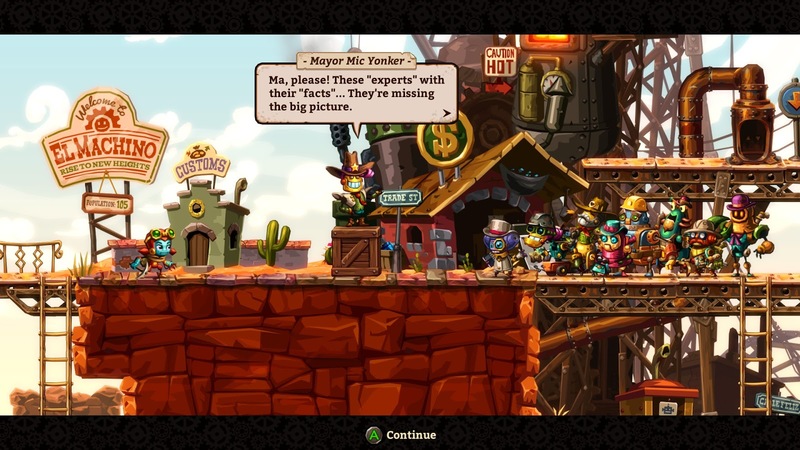 First up is Steamworld Dig 2, which is, unsurprisingly, a sequel to the original Steamworld Dig, a game I thoroughly enjoyed when it came out. This is the third game in the burgeoning Steamworld setting that developers, Image and Form are crafting. The also excellent side scrolling turn based Steamworld Heist came in-between. Once again the delightful art style, and engaging characters that have inhabited the series so far are on display. 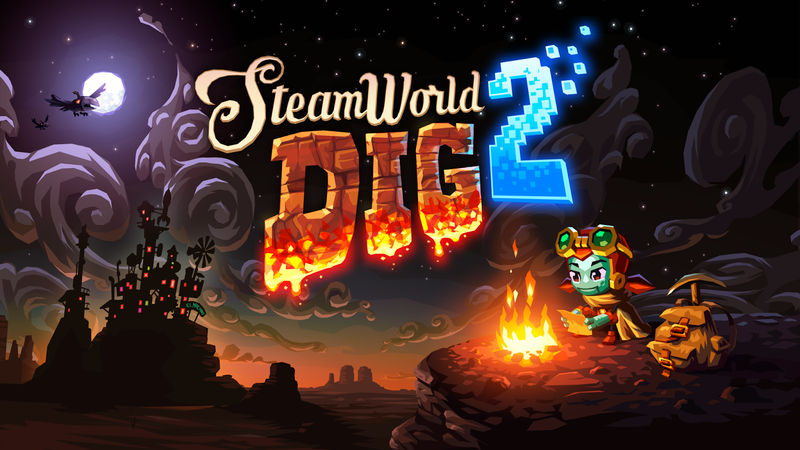 As you might expect this one offers more of the same as the original as your robot hero digs down and down, collecting gems, searching for upgrades, finding secrets, and fighting bosses. 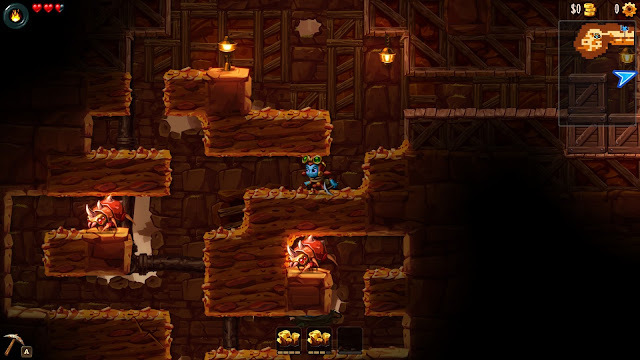 The core loop is effectively a rogue-like where you make a run to see how deep you can get before your resources run low and you either die, or escape to preserve more of your loot. Once again you can upgrade your various devices allowing you dig deeper and deeper as the game progresses. The game does a great job of breaking up the game-play with boss fights and has an enjoyable, if simple, story to uncover as you go. The art is the real star for me. The core gameplay loop is compelling enough, and has just enough variation to keep you going. The world and character art though is where the game truly shines. It's a wonderful colorful world, and while it trades on all the old west cliches you can imagine, it does so in a way that seems genuine. There is just the right combination of visual gags and original ideas on display that pull you in. I'm not usually a huge fan of direct sequels, but this one is an exception. Easy to recommend! This indie offering by developers Forgotten Key isn't so much a game in the traditional sense as it is an exploration simulator. It's not strictly speaking a walking simulator as you'll spend much of your time flying. 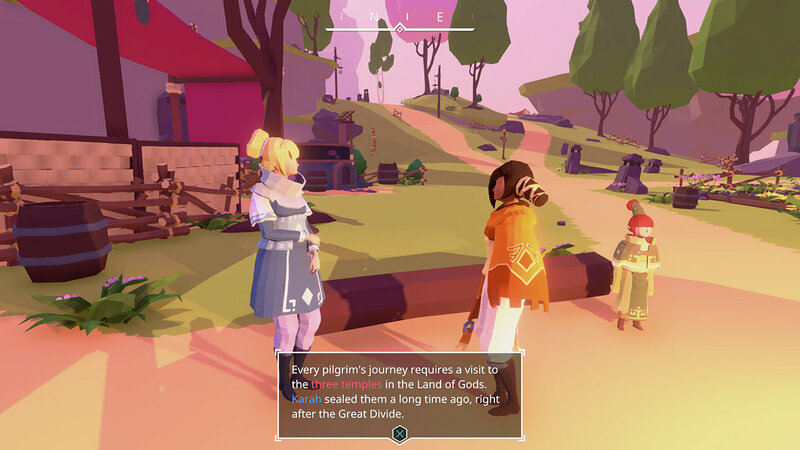 Your character can switch between human and bird form at will as she explores a series of fractured islands. The low poly art style is well conceived and manages to create some beautiful vistas. There is a story to discover, but anyone seeking a Zelda style adventure will be disappointed. There are some ancient temples to discover and explore, and a story to unravel as you explore the various islands, but here the exploration itself is largely the point of proceedings. There is no loot to collect, no stats to ponder over, no combat to get in the way. You simply explore. While it is clearly inspired by the seminal Journey, it lacks the mystery or the sense of motion that made Journey such an effective experience. You'll also find the 'ghosts' of people past, in much the same way that you did in Everyone's Gone to the Rapture. They will often provide additional Lore, and occasionally subtle (or not so subtle) hints as to what might be nearby. The open world here actually does the game a slight disservice in that regard as you never feel compelled to proceed in any particular direction. That said, I found myself strangely drawn to just flying around and exploring. When I stumbled upon one of the underground sections it was fun and and those locations did draw me through the caves in search of whatever nugget of lore had been hidden down there. So there is much to love her even if it fails to scale the immersive heights of the game that clearly inspired it. It is a relaxing, beautiful experience with an excellent soundtrack if you are so inclined. Not sure what December will bring, so might try to go diving for some more indie delights!